Round 2 of the Victorian Country Series was held at Portland on May 24 and saw 181 entries assembled for the 13 classes on offer. Featuring the Colin DeVreis Memorial to be contested in the Clubman Light class, a great days racing was expected. Greeted with overcast, but dry conditions with light but chilly winds, the rain stayed away and some fantastic duels were played out on the magnificent 752 metre Yarraman Park layout. The Portland club dedicated this class to the memory of long time member and steward, Colin DeVries and with 19 entries a good field of drivers lined up for the first heat. With Drivers of the caliber of young gun and Birtek Motorsport supported Scott McLaughlin and Allansford Kart Supplies Carly Anderson in the field, racing was guaranteed to be spectacular. Heat one saw McLaughlin off pole and as expected he drove away to a comfortable win with the 22 kart of Anderson behind him. Local Matt Keiller was third and the 46 kart of Wayne Bourke in fourth. Heat two had McLaughlin and Anderson starting down the back of the field and it was Ballarat’s Ben Beasley that took advantage of the situation with a win from position two on the grid. 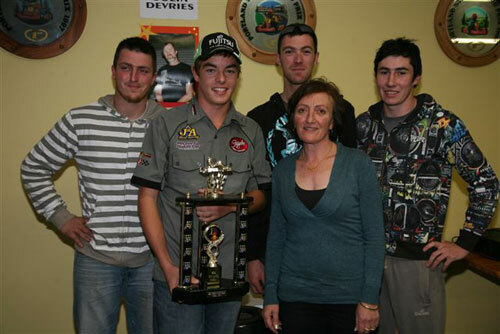 McLaughlin showed why he is such a talent by finishing third, with the 29 kart of Joshua Tynan in second. Anderson’s race finished early on lap one. With McLaughlin off pole in the final it would be difficult for anyone to challenge him given his performances in the two heats, and as it turned out that was the case, with all the racing occurring for the minor placings. A good dice between Beasley and Tynan saw Tynan take second with a last lap move with Baesley third across the line in front of Wimmera’s Ash Lear (who turned 19 that day) and Maverick Benson. Overall it was McLaughlin, Tynan and Beasley. Heat one saw 20 Midgets face the starter, young South Australian driver Chase Wooley setting the early pace with Blake Graham in hot pursuit. On lap 6 of the 8 laps Blake made his move at the end of the main straight to relegate Chase back to second. The pair maintained this order over the final two laps with Blake taking the win over Chase with Tom Hughes in third. Heat two saw the two pace setters in the first heat starting down towards the back of the field. By lap 7 Blake had worked his way through the field to be leading the class with Chase close on his rear bumper. Portland youngster David Denboer showed consistent speed and nerve to take third in heat two. With Blake and Chase out of one and two for the final the scene was set for a great race. The pair did not disappoint the crowd with some great close racing over the 10 lap final. In the end it was Blake that took the win with Chase in a gallant second, with the number 5 kart of Tom Hughes crossing the line in third. Overall Blake Graham took first with a clean sweep, Chase Wooley second and through steady consistant top 5 finishes the young Jordan Rae from the Geelong club took third. 16 drivers faced the starter in the rookie class and with the number 6 kart of Jake Klein starting off pole it was always going to be a difficult job for any of the others to chase him down. The big movers in the first heat were the Mt Gambier bothers Mitchell and Ryan Broome, with steady drives through the field to follow Jake across the line in second and third respectively. The big mover in the first heat was the 95 kart of South Aussie karter Rhys Wooley making his was from 16th on the grid to a credible 5th as they crossed the line on lap 8. Heat two saw the 95 kart of Rhys Wooley off pole and with the 94 kart of Will Hawkes beside him, however by lap two it was the 25 kart of Mitchell Broome that got a good start from 4th on the grid to make his way to be following the the 95 kart of Wooley. By lap 5 Broome had moved into 1st with the 6 Kart of Jake Klein hard charging through the field to be in second. On the 7th lap Klein took the lead and was never headed, with Broome hitting trouble on the last lap 2nd was taken by Wooley, followed by the 12 kart of Tyler Morrison, Ryan Broome and Mitchell Broome. The final saw Jake shuffled back to third on the first corner as Mitchell Broome and Wooley got a good start, by the second lap Wooley and Klein had manoeuvred their karts past the 25 kart of Broome into first and second respectively. With only five competitors in lights and 4 in heavy the stewards combined these classes with heavies racing behind the lights. In the Lights it was Warrnambool’s Nick Gottlewski showing the others how to do it coming out of position 3 to take over the lead from another Warrnambool member in Broe Shiells in lap 5 and never being headed. Mt Gambier’s Ian Thornley running in a close third followed by Matthew Graham and Wayne Bourke. This was the same finishing order for both the heats and the final, as Gottlewski took the class with a clean sweep from Sheills and Thornley. In Heavies, it looked to be a closer race with the current state closed plate holder Cory McCullagh up against Portland’s Scott King having his first real run in this class in a borrowed Rotax. The race turned out to be a ripper between King and McCullagh with King making a big move up the inside on the left hander at the end of the pit straight to take the lead with three corners to go and just hang on for a good win. In the second heat and the final it would be mechanical problems plaguing McCullagh to give an easy win on the day to King with Andrew Stasse second and South West’s Peter McDonald of Powermac exhausts in third. 11 starters in the senior national pro class ensured that the cheapest class of racing would provide exiting racing across all the heats and finals. And the crowds weren’t disappointed. With three Portland drivers in the field it was going to be hard for the rest to make an impression. In heat one it was local Declan Sherwell out of position 1 ready to set the pace, However, it was Geelong’s Andrew Rae taking the lead in lap two and never being headed. With Sherwell taking a well deserved second after a clean pass on the last corner left him and another local Josh Tapscott after starting in 8th in a drag race to the flag. Brad Anderson, he third local driver drove a great race from 10th on the grid to take fourth in heat 1. Heat two saw Anderson starting on the front row and with the consistent pace he showed in first heat was going to be hard to beat, this proved to be the case with Anderson having a deserved wo to go win, two kart lengths ahead of the number 9 kart of Rae crossing in second in front of Tapscott in third. The final promised to be a beauty with anyone of the above mentioned drivers showing the speed and capability to take the win. As it turned out when the light went green it was Rae and Anderson that broke away to a commanding lead over the first 4 laps followed by Tapscott, with Mt Gambier driver John Dankowski in fourth and Sherwell in Fifth. Tapscott showed great kart speed and consistency from lap 4, reeling off 5 consecutive fastest laps to pass Andreson on lap 7 and be under the back bumper bar of Rae as they crossed the line. Rae with two wins for the day took the trophy from Anderson in second and Tapscott in third. With the newly crowned Victorian Open blue plate holder being Portland’s Aaron Johnstone, he was going to be the one to beat in JNH. However, with the likes of Southern members Simon Hodge and Guy Walker and GKCV’s Anton DePasquale and Mitchell Wilmot he was sure not to have it all his own way. This proved to be the case in heat one with Wilmot leading the way for the first couple of laps before Johnstone stormed though the field from 8th to take the lead on lap 3. DePasquale continued to pressure Johnstone and late on lap 5 made his move and took over the lead from him, further back it was Guy Walker making his way forward and with two to go he made his way past the 81 kart of Wilmot to take a handy third. Heat two was dominated by Johnstone, in that he took the lead in lap two and was never headed, that doesn’t mean he wasn’t pressured with first Wilmot then Walker pressuring him to the line. The heat finished in the following order Johnstone, Walker, Wilmot (from rear of grid) , Hodge and DePasquale. The final looked like being a cracker with Johnstone, Walker, Wilmot, DePasquale and Hodge all in with a big show. With the 63 kart of Johnstone off pole and his local knowledge a good start was going to be needed by all the challengers. It was Johnstone who got the start with Walker in hot pursuit. A coming together of a number of karts on the second corner saw the karts of Balcombe, Quiddington and Hodge parked on the infield as the front runners sorted themselves out over the 10 lap final. Walker looked as if he may have the edge over Johnstone however, on the eighth lap his kart slowed to crawl has Johnstone drove away to the win, followed by DePasquale, Wilmot, Lovekin, Wommersley, Walker, Henley, Sudholz and Diamond. This gave Johnstone the win for the day followed by DePasquale and Wilmot in third. 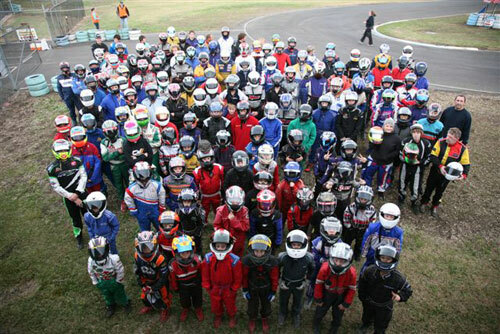 A good field of 18 karters faced the starter in JNL, with Andrew Petrou showing them how to do it with superb drive through the field after starting from 14th on the grid to finish second behind the 94 kart of Bradley Jenner who started out of position 1. Tod Hazelworth finished 3rd followed by Luke Walker and the 5 kart of James Hughes in 5th. Heat two saw Jenner the winner of heat one starting down the rear of the field with all the work to do. A good start out of position 5 on the grid saw Jordan Nicolaou take the lead, he show great kart control and was never headed. Petrou starting out of 2 had a bit of a nanna nap off the line and dropped back to 8th before settling down and finishing a solid second. Jenner drove a solid race to finish in third, followed by by the 70 kart of Luke Walker and Hazelworth. The final looked like being a beauty with any of the five front runners having the speed and capabilities to win. With Jenner off pole and Petrou beside him the race started well for Jenner, whilst Petrou went backward after being held wide intot the first corner, with the 34 kart of Nicolaou moving from fifth to second in the first lap. Nicolaou passed Jenner on lap four with the 78 kart of Petrou following him through into second after his poor start, relegating Jenner to third. Petrou made his move and passed Nicolaou on lap 6 and that’s the order they finished in. Petrou, Nicolaou, Jenner, Hazelworth and Campana. Results for the Petrou first, Jenner second and Hazelworth third. Nine leopards hit the track for the first of their heats with Mt Gambier based Portland member Ben Kilsby in good form he was going to be hard to beat. However it was Southern’s Josh Tynan that broke away at the start with Kilsby in hot pursuit, Mt Gambiers Kyle Summers retired early and the big mover in the first heat was the 5 kart of Eastern lion’s member Mitchell Cuzens moving from 7th to finish a credible third. Heat Two saw the 55 kart of Andrew Stubbs out of pole but a poor start saw him relegated to 6th as they passed the starters box for the first time, again it was Kilsby and Tynan driving hard through the field to be one and two by the second lap. Tynan showed good patience following the 3 kart of Kilsby until lap 7 when a pass under brakes at the left hander at the end of pit straight saw him take the lead and continue on to the win with Kilsby in second and the 36 kart of eastern Lions Jake Fouracre. With the pace shown by both Tynan and Kilsby it was going to be difficult to see anyone of the competitors challenging these two in the final. Again Tynan showed patience in not making a move to pass Kilsby until late in the race to go on to take a clean sweep of the class. It was Kilsby in second, two thirds for the day were enough to give Jake Fouracre third for the day ahead of Cuzens, forbes-Wilson and Wimmera’s Kelin Crane. 16 of the older racers presented on the grid for their first heat and with drivers of the likes of Mildura’s Greg Matchoss and Wimmera’s (and current state black plate holder) Leon (Bucket) Forrest the other 14 drivers needed to be on their game to trouble these two. So it was to be, a Matchoss/Forrest tussle at the front from the second lap to fight it out for the chequered flag. In the end Matchoss hung on in front of Forrest and South West’s Bevan Walker holding down third . The second heat of the old fella’a saw the biggest crash of the weekend when on turn 1 a spin in the middle of the pack saw half the field grind to a halt. With both Forrest and Matchoss in amongst the stalled karts the podium positions on race restart was anybody’s. When the chequered flag was waved at the end of heat two, it was the 46 kart of Trevor Handley that crossed the line first followed by Walker and the 52 kart of Hamilton’s Ken Lampard. The final race saw all competitors make it round the first corner and settle down to display some fine driving. At the end of the 10 laps it was Matchoss to greet the flag first followed by Forrest, Handley, Lampard, Henley and Walker. Overall, results were Walker 1st, Matchoss 2nd and Lampard 3rd. It must be noted that there was only 120 points that sererated 1st from 6th in this class. With a reasonable field of 11 of the “big fella’s” hitting the track, and the 88 kart of Nathan Van Hulst missing due to other commitments the ones to beat on previous form would have to be the 15 kart of Hamilton’s Andrew Hayes and the 5 kart of Eastern Lions member Simon Cuzens. However, it was the 57 Kart of Joe Romeo showing the way for the first 5 laps of the first heat. Eventually Hayes made the pass on Romeo and took the win, with Romeo second, followed by Cuzens, Pech, and Marshall. Heat two saw the 5 kart of Cuzens off the near the rear of the grid, and a good start and consistent lap times saw him take the lead on lap 6, from here he was never headed with Pech in Second and Hayes following him through in third. In the junior high performance class five drivers had the ability to take home the silverware, with local hope Aaron Johnstone, Southern’s Simon Hodge, GKCV’s Mitchell Wilmont and Jordan Nicolou and the only female in the class the Mount Gambier’s Stephanie Munn all in with a good show. Heat one saw the 63 kart of Johnstone off pole and with his local knowledge was able to lead from start to finish, that doesn’t mean he had it all his own way with Wilmont hot on his heals in secont and the 41 kart of Hodge in third after starting out of grid position 6. Heat two it was Johnstone with all the work to do fro the rear of the field, as it was the 14 kart of Hazelwood took the lead on lap 2 with Hodge in hot pursuit, on lap 7 Hodge took the lead, this relegated Hazelwood to second with the 95 kart of Jarman Dalitz crossing in third, followed by Rhys Devlin, Johnstone, Brett Dillon. With Hodge and Johnstone off the front row the final promised to be close. Johnstone got the hole shat at the start and again with his local knowledge and kart set up quickly put some distance between him self and the rest of the field. As the laps wore down Hodges kart started to wok and he set some good laps to begin to reel Johnstone in. In the end he ran out of laps and it was Johnstone, Hodge and Nicolou crossing the line in first, second and third. A win, second and a third for Hodge was enough to give him the win on the day from Johnstone by just 21 points with Mitchell Wilmont in third. With the likes of locals Scott King, Kimberly Johnstone and Kevin Millard, Eastern Lion’s Mitchell Cuzens and Go Kart Club’s Brooke Pearson, the other 17 drivers would have to work hard and have some luck on their side to up the pointy end at the completion of heat one. As it was with Millard off pole he took the lead with the 15 kart of Cuzens in second, King starting off 8 in the big field worked his way aggressively forward to be third on lap 4, by lap 5 he had moved to second and on lap 6 made his move to first. As the crossed the line it was King, Cuzens, and Millard followed by Pearson, Halesworth, Brennan and Johnstone. Heat two saw the 93 Tony Kart of Travis Millar from the Oakleigh club get a blinder of a start from position 4 on the grid and never be haeded, King out of 13 show great speed to finish second with the 98 kart of Kimberly Johnstone in third followed by Giddings, Cuzens and Millard. With King off pole in the final, with Millar beside him and Cuzens out of three, the final proved to be a beauty. Millar led early with Cuzens moving into first on lap 3, and King dropping back as far as fourth, he had all the work to do. With Cuzens holding down first and MIlar in second, Millard moved into third ahead of King. King regained third for Millard and that the way they crossed the line. Cuzens, Millar, King and Millard. King with a win ,second and third had done enough to take the silverware from Cuzens and Millar with locals Millard and Johnstone in fourth and fifth. The Portland Club would like to thank the businesses that supported this meeting and look forward to the continued support to karters for this series.